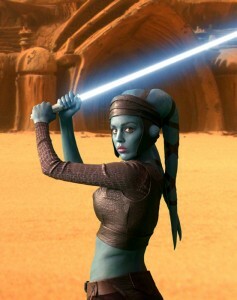 Aayla Secura, born Aaylas’ecura, was a female Rutian Twi’lek Jedi Master in the later days of the Republic, who served with distinction as a General during the Clone Wars. She served as a Padawan under the tutelage of Quinlan Vos, and later, Vos’ own master Tholme. Both Secura and Vos survived a brush with the dark side early in their Jedi training, though she later proved herself worthy of knighthood. Lekku around mid back to waist in length. Lekku color must match skin color and have lighter colored spots. They must be wrapped with two strips of leather (or similar) around each lekku, which ends around the edge of the shoulder blades. The strips start under the headgear, top and back. Dark brown leather or leather like headgear that goes all the way around the head and closes in the back under the lekku tails. Headgear has earflaps with holes for the ear caps and a black elastic strap under the chin. Headgear must resemble what is seen in the references. Ear caps matching body color. Ear caps must be positioned straight over the customer’s own ear to be level with eyes and nose. Inner mid-riff top with dark brown pattern. Only a long fitted left sleeve, no sleeve on the right. Pattern must consist of irregular rectangles placed closely together according to references. Inner top must have a deep U cut front and back and be self-lined. Outer mid-riff leather (or similar) top in medium to dark brown color. Top must be matte and have texture. Top goes over left shoulder and left breast and under the right breast. Front and back are mirrored. It has a wide border at the bottom, which closes on the right. Top must not have raw edges. Medium brown leather (or similar) belt with a front and back apron. Belt is closed in the sides with dark brown leather cord in an X pattern. Cord hangs down to knees, two strips on each side. Aprons are five sided, but have different lengths and shapes with the back apron being wider than the front. Both have a smaller pentagon with unequal sides and incised lines, lining up with the belt. The aprons have a lighter border. Aprons should match references. Silver colored lightsaber hilt. Preferably of one of the designs she is seen using. No toy sabers. Dark brown knee high leather or leather-like boots with a wide heel. No spike heels. Boots have inside zipper and can have matching flap around ankle.